One of the frustrations of my job is that I have to work with unsatisfactory catalogues. So for Ukraine I use the Bulat catalogue because it has numbers (unlike Dr Seichter's handbooks) and is in English and in one volume (unlike, say, Dr Ceresa's Handbooks). It is easy to obtain. But it is littered with typographical errors which make it impossible to sell some stamps because they have been omitted altogether, don't have numbers, or have misprinted prices. The illustrations are pretty useless. For Armenia, Michel is good because it bases itself closely on Zakiyan's work but it omits philatelic counter productions. Gibbons is quite good because it bases itself on Tchilingirian's work which does list counter productions but Tchilingirian's research was done over fifty years ago. Zakiyan has good illustrations, it's usefully in Armenian, Russian and English but it does not give valuations. The presentation is not helpful. Equally, it's true that Michel's numbering system drives everyone crazy. The most common Armenian cancellation of the 1919 - 23 period is ERIVAN "d". It came into use some years before and it remained in use until 1924 - 25. Not surprisingly it has been forged: Tchilingirian and Ashford illustrate four different forgeries, Ceresa lists six. Since they wrote their books, new forgeries have been made. The ARTAR catalog contains at least 25 colour illustrations which include strikes of ERIVAN "d", the first ones on page 9 and the last on page 183. I count 11 illustrations which show genuine examples of this cancellation; 7 which show forged cancellations; and 7 which I would not want to determine on the basis of a visual inspection of the catalog page - some are cancellations on dark stamps and so on. Some of the faked cancels I have seen before, outside the pages of this catalog. If you want to see how I am doing it, compare the cancellation shown on page 12 with that shown as a receiver cancellation on page 49. Pay espcial attention to how the serial "d" is formed (I am sorry; I do not have Cyrillic on Blogger). The item on page 12 is the one with a forged cancellation. 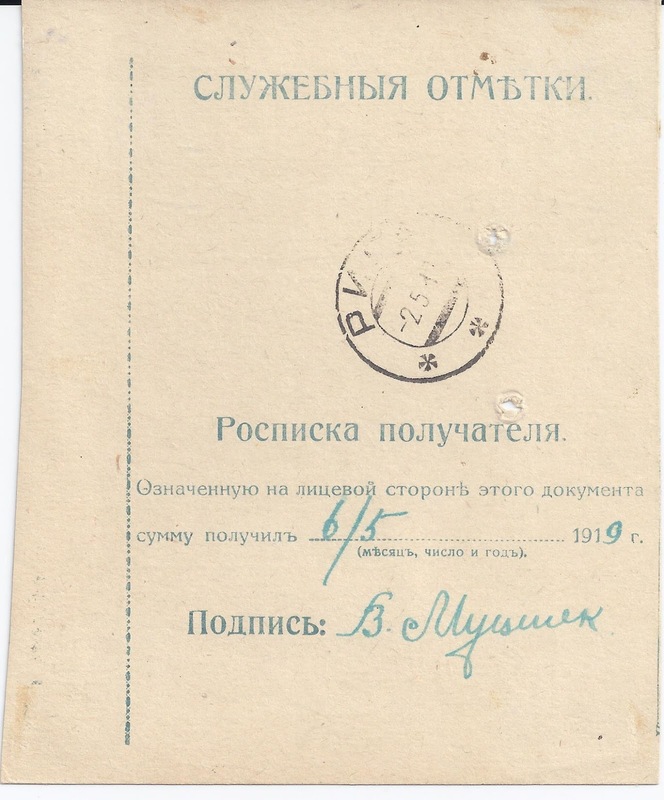 The item on page 49 shows an example of the genuine cancellation. I use the word "fake" partly because I have been able in the past to carefully examine examples of actual faked cancellations rather than just illustrations and have been able to discuss with other collectors and dealers the provenance of such material. I have written about this in such articles as "Is this cover genuine in all respects?" (British Journal of Russian Philately, number 87, December 2001, pages 38 - 42; "The Sad Fate of Armenia's Archives", Rossica, No 137, Fall 2001, pages 8 - 13 where due to an editorial mix-up Figure 5 is labelled "genuine" when it should be labelled "Fake" ...). If I was working from the ARTAR illustrations alone, I should probably use the word "doubtful" pending the actual examination of the material, though in most cases the illustrations are clear enough for a verdict to be given. I have always believed that when the Paris printers Chassepot prepared the first pictorial stamps of Armenia in 1920, they despatched only the low values in the Eagle design to Yerevan. By the time they got to print the high values in two colours, the Dashnak regime had collapsed. The high value stamps were remaindered from Paris, which is why they are more common in Europe than the low values, many of which had been despatched to Yerevan. (For the later crude Reprints, all values are equally common). This story would explain why Christopher Zakiyan, in his book Armenia: Postage Stamps, Fiscal Stamps, Postage Cancels (Yerevan 2003, pages 63ff) lists Soviet fiscal overprints on only the 1,5,10 and 15 rouble Chassepot stamps, which are also the only values which appear on the documents he illustrates (There is an unexplained mystery about what happened to the 3 rouble Chassepot stamp). In the ARTAR catalog, it seems that the same account is going to be accepted from the text on page 126, but then on page 132, we are shown fiscal overprints on all the high value stamps with accompanying high valuations (minimum $450). But if the conventional wisdom is correct, these high value stamps were not available for overprinting because they had not been sent to Yerevan. So any fiscal overprint on these stamps, whether Originals or Reprints, must be a fake. (On page 131, ARTAR also lists the 3 rouble with fiscal overprint and also gives it a $450 valuation). These overprints on high values were first announced to the philatelic world in an article by Joseph Ross ("Armenian Revenue Stamps and their Uses", The Post-Rider, No 41, 1997, pages 40 - 48). I replied in issue 49 of the same journal (November 2001, page 111). By this time I had seen actual examples of the overprints on the high values, all of which were identical in terms of frame line breaks and so on. From this I concluded that they had been digitally produced on the basis of a scan from just one stamp. Examples I saw included ones on reprints, so necessarily fakes. These stamps had all come from one source in the USA. All were mint, as are all those illustrated by both Joseph Ross and ARTAR. The conservative and, I believe correct, position is this: there is no good evidence for the existence of fiscal overprints on the Chassepot high values. The best information we have is against the possibility. The stamps listed at page 132 of ARTAR must be fakes. The listing given by Zakiyan in his 2003 book should be retained. As a general point: Armenian revenue stamps of this 1918 - 23 period are actually more common on documents than as loose stamps. Mint stamps are rare. This is because most examples remained locked in Armenian archives until around the time of the collapse of the Soviet Union. At that time, quite large quantities of documents became available in Europe and America. Someone once said to me that postal history collectors are really stamp collectors in disguise. Part of the evidence, the fact that pre-philatelic mail trades at a huge discount on the prices achieved for early franked mail even when the cancellations, the routes, etc are very much the same. In addition, pre-philatelic mail is often in excellent condition because dealers and collectors have not been adding their pencil notes, their hinges, and their autographs for the past 150 years or more. More evidence is in the fact that big areas of postal history are neglected because the stamps on the covers are the wrong sort of stamps. 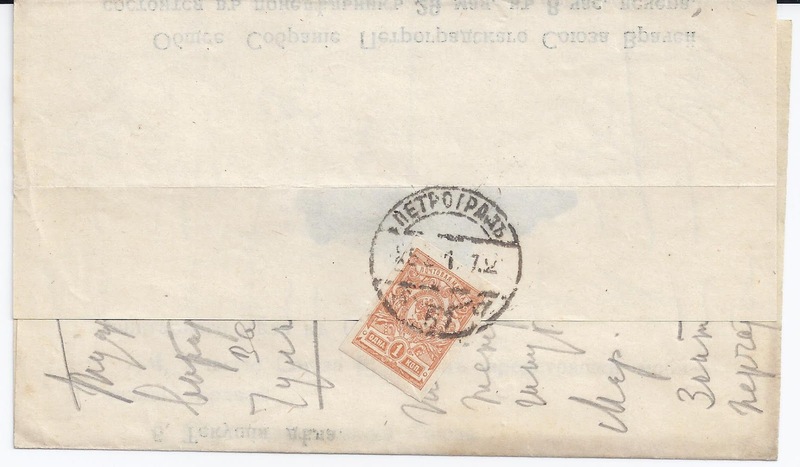 Collectors who supposedly specialise in the Russian Soviet Federative Socialist Republic (RSFSR) of 1917 – 23 generally show very little interest in the period 1917 -21 when mail continued to be franked with Imperial adhesives. 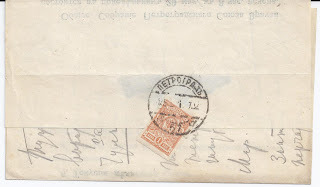 Likewise, collectors of early post-Imperial Latvia want to see Rising Suns on their postal history, not Imperial stamps. But from 1917 to January 1920, there also existed Bolshevik-controlled areas of Latvia and even a Latvian Socialist Soviet Republic, with is capital first in Riga from January until May 1919, then in Dvinsk [Daugavpils] and finally in Rezhitsa [Rezekne] where a new Cyrillic canceller was used which included the word “Latvia” rather than old Imperial “Lifland”. It’s true that it requires a bit of work to establish what is and isn’t Bolshevik mail and also to get over the fact that much of what exists was seriously damaged by The Cutter - a post office clerk employed in Riga to clip stamps on Money Transfers and Parcel Cards and who took an utterly pointless job very seriously. Here for example is what could have been a very attractive Money Transfer Card. 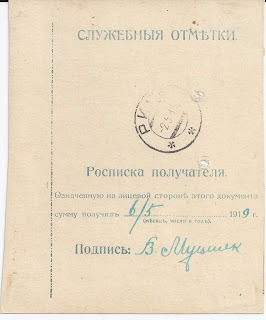 Addressed in Latvian, this card sends 3 rubels to the editorial office of “Zihna”, founded in 1904 as a Latvian Social Democrat journal and in 1919 the journal of the Latvian Communist Party, headquartered in one of Riga’s main streets, Elisabetes iela. The card is an Imperial card and so is the etiquette bottom left which reads SEGEWOLD LIFL. in Cyrillic. But with the declaration of Latvian independence, Segewold became Sigulda and acquired a nice new Roman script canceller and a nice supply of red ink. But when Sigulda came under Bolshevik control in December 1918 (and remained so until October 1919 – von Hofmann’s dates), the Soviets used boring Imperial stamps in preference to Rising Suns, in this case 5 x 5 kop imperforate stamps paying the minimum Money Transfer fee of 25 kopeks. 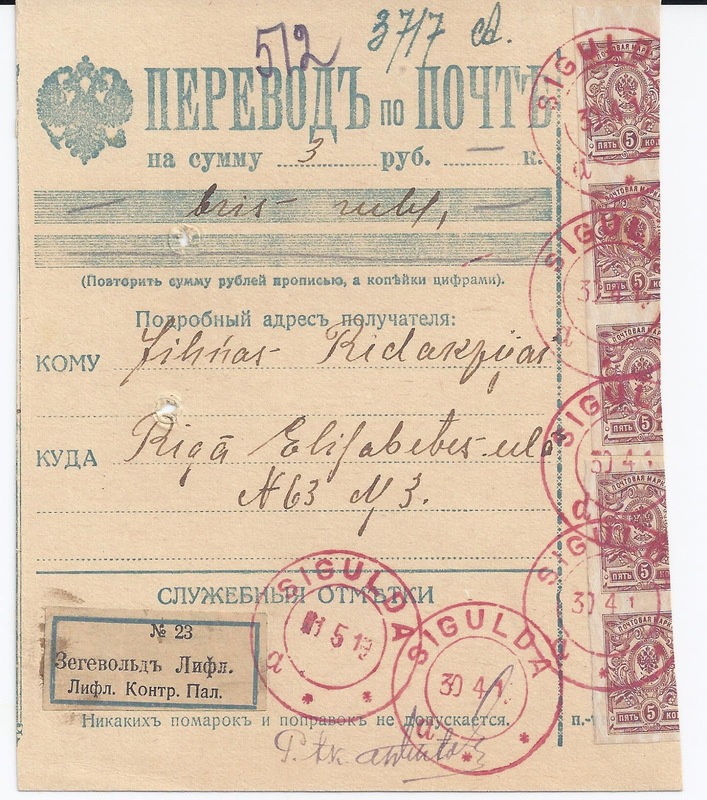 The card arrived in Riga on 2 May 1919, shown by an old Imperial Cyrillic canceller for RIGA applied on the reverse. The representative of Zhina signed for the card on 6th May. 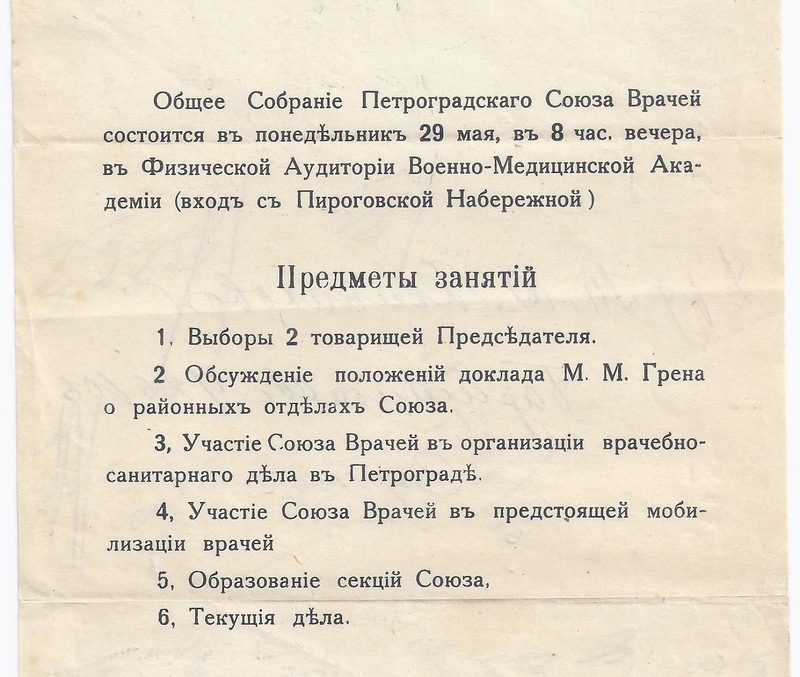 On 1 November 2013, I blogged here about the One Kopek Tariff which existed continuously in Imperial Russia from 1866 to 1917 and ended only under the Provisional Government: from 14 August 1917, the lowest tariff was set at 2 kopeks. 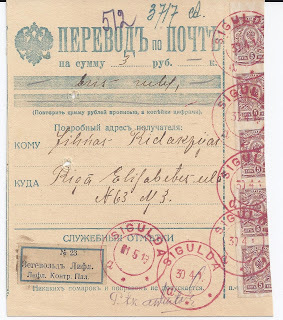 The conditions of eligibility for the 1 kopek rate varied a great deal in that 1866 – 1917 period, but in principle, it is possible to find every type of Imperial 1 kopek used as a single franking. It may be that the hardest one to find is the imperforate 1 kopek issued in April 1917. April to August sounds like a reasonable period of time, but if a post office or an individual still had perforated 1 kopek stamps available, then they might well choose to use those because easier to separate – try finding a pair of scissors when you need them! Since I began looking for 1 kopek frankings many years ago, I have only found one with the imperforate. 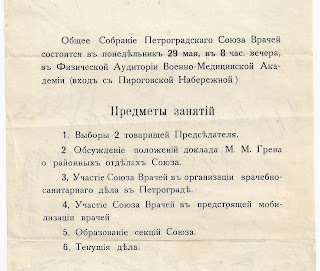 It is used on the circular shown below and cancelled at the Petrograd 57th office on 25 5 17. I am today writing up the item for despatch to auction. My preparations for BREXIT are very simple. By the end of March 2019, most of my better stock will be physically located in Finland and Germany, queued for auction at Suomen Filateliapalvelu and Heinrich Koehler. If there is a Hard Brexit with traffic chaos (including chaos in postal services) and bureaucratic confusions about tariffs and whatever, then I will be able to wait for sanity to return – which may be never, of course. If sterling goes the way of the pesos and liras of the world, then I will benefit from my €uro-denominated auction sales (and so will Her Majesty's Revenue and Customs). I have already benefitted in the past two years with sterling an average of 15% down against the €uro since the United Kingdom’s Brexit referendum. There is no scenario in which sterling will regain that loss. Just think, when the €uro was introduced - I was in Amsterdam on changeover day and Guilders had disappeared by lunch time - the rate was 1.40 €uro to one £ sterling and climbed to a peak of about 1.75 in the year 2000. Back in England, I am afraid I shall only retain cheap stock with a low value to weight ratio which does not justify shipping to Europe. Since it is likely under every scenario that my UK clients will have less money to spend as consumer prices rise and the economy shrinks, then cheap stock is the sensible thing to have – and even then, not very sensible. But it will be something to do, a hobby, and I think it will increasingly remind me of how things were in the old, poorer, eastern Europe. I recall one day in Prague in the 1990s going to the weekly collectors’ bourse where I asked to take a table for the afternoon. It cost me the equivalent of one euro – and I got a receipt! Of course, I didn’t sell very much but it was a happy afternoon. Meanwhile, like many UK-based businesses large and small, I am buying (investing) very little. I am sitting on money in the bank and letting my stock levels fall, waiting to see what happens and for the moment assuming the worst.